When many people think of kayaking, they think of a relaxing and peaceful trip down a lazy river. To some others, it makes them think of adventure and excitement. This type of boating can be both of these things and more. Kayaking is as varied as the people who paddle. It’s an activity that can be done by all ages, preferences, and abilities. Each form of kayaking has a preferred type of vessel to go with. 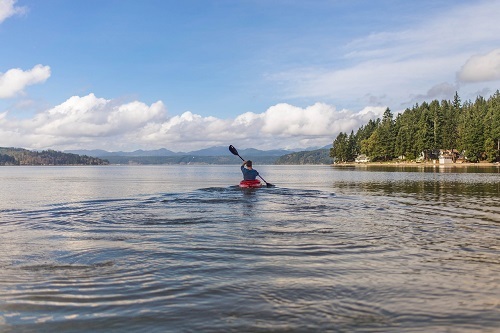 If you’ve never been in a kayak, or have only tried one form of this type of boating, there are many options out there that you can experience. The following are three forms of kayaking that you need to try and the type of kayak that is best for each one. Sea kayaking can seem like an intimidating type of boating. You’re set adrift in the ocean or another very large body of water. It’s unpredictable and extremely exciting. For this reason, the vessel that you have to use has two bulkheads. One’s on the bow, placed in front of where you’re feet go, and the other is in the stern behind your seat. The bulkheads, along with the hatches, let the paddler store any of their wanted gear. This extra storage is perfect if you’re planning on going on a long trip or are camping. Sea kayaking can take a bit of getting used to. When you do get comfortable though, these sea vessels are easy to paddle. Plus, they usually include a rudder which will help you steer out in open water. They’re designed to cut through pretty sizeable waves thanks to their aerodynamic design. These boats usually weigh a lot and are typically 15 to 19 feet in length. Before you try this form of boating, take the time to practice re-entry of the boat and rescues on calm water. Also, understand the essential safety practices and principles of navigation. If you love fishing and kayaking then you can combine your two loves with kayak fishing. There a number of advantages to using these types of vessels as opposed to other boats for your fishing. For starters, you don’t have to wait in line at a public ramp to launch into deeper water. Most vessels can float in 6” of water while holding 350 pounds of cargo. Using a fishing kayak for your favorite sport also lets you move silently through the water. This means that the fish in the area are less suspecting, allowing you to catch more than you would in a loud motor boat. Fishing from such a small vessel allows you to scale down. The vessels meant for this sport offer a lot of storage, but there are a few limitations as to what supplies you can take with you. All you really need after all is a rod, some lures, and a container to hold the fish you catch. Whether you’re kayaking for fun or kayaking for sport, kayak fishing is something worth trying. These boats are meant for bodies of waters where rapids are found: creeks, rivers, and streams. When you try this form of boating, you should use the whitewater classification system to determine the level of difficulty. Whitewater boating is the ultimate way to experience the thrills of being on the water. It’s fast-paced, exciting, and very dangerous. Before trying this form of boating, you should take the time to fully understand the many skills needed to face the rapids. And remember, never face the rapids without a partner. The vessels designed for this sport are specially made to withstand the intense environment. While this form of boating is something you should try, you should definitely learn all you can before putting your skills to the test. A boat can allow you to see beautiful scenery, explore unreachable places, and travel to beachside campgrounds. No matter what you intend to use it for, having a kayak is a guarantee that adventure is in your future. This entry was posted in Water Sports, White Water and tagged Kayaking. Bookmark the permalink.